If you are looking for a watch to use during your next (or first!) triathlon, there are a few key components to consider. Choosing a watch for a triathlon is not as simple as, say, choosing a watch for running. Remember — A triathlon consists of swimming, cycling, and running. A triathlon watch tracks your movements for all three. As you can imagine, because of the diverse nature of a triathlon, your watch must be built to last. And I’m not only talking about durability. I’m also referring to staying accurate and holding a consistent charge. After all the sweat, dirt, and water, if you don’t have a durable watch you will find yourself in the same place you are in now: watch-less. But as luck would have it, you happened to stumble upon this page. A page filled with a whole lot of information to help you pick out the best triathlon watch for YOU. First, I will go over the critical components for picking out a watch. Simply put, I will explain how to pick one out. Then I will list the 8 best triathlon watches to choose from in 2018. So let’s get started. Okay, so you decided to buy a triathlon watch. Great! … now what? Sure, the concept makes sense: buy a triathlon watch to help you complete a triathlon or become better. But what in the world should you look for when choosing a watch? And how in the world do you differentiate one from the other? If it seems complicated at first, don’t worry, it will get simpler…MUCH simpler. Soon that digital device attached to your wrist will become a part of you. It goes from a complicated foreign piece of equipment to a simple-to-use tool. And you may use it so much that you start mistaking it for an extra limb on your body! So what EXACTLY do you look for when shopping around for a triathlon watch? It will make the most sense to break it down into three categories: swimming, biking, and running. Then I will finish with a few key components that are essential no matter what activity you are performing. First, make sure your watch is waterproof. You swim during a triathlon so your watch must be water resistant. To check if it’s waterproof take a look at the ATM rating. ATM stands for ‘atmospheres’ and is the rating your watch uses to describe how waterproof it is. A rating of 5 or more is plenty for triathlon swimming. 5 atmospheres means the watch can withstand five times the pressure at sea level without allowing water in. As you will see below, most of the watches are somewhere in the 50 to 100-meter range. With a 5 ATM or higher, you can be confident your triathlon watch can withstand the water exposure of a triathlon. You can be pretty confident any watch advertised as a “triathlon watch” will be waterproof. However, make sure to always double check before buying one. NO ONE wants to find out their new watch isn’t waterproof only after swimming for the first time. It only takes a few seconds to check, and you will be glad you did. You also want to make sure you watch tracks you while swimming. The better watches will track your speed, stroke length, and even your stroke per minute. Some of the more affordable watches will just track the basics like lap times and calories. 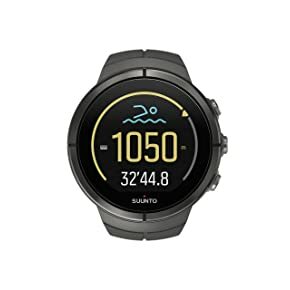 So remember, not all watches will have open water swim tracking. You get what you pay for. But when your watch has an open water feature, you will know it has a reliable GPS system. So if you’re spending a few extra bucks on a watch, this may be a feature you want to have. This way you know it will always provide the most accurate data in general. You will want to determine if you triathlon watch has a cycling mode. With this mode you can measure rotations per minute, speed, time, and distance. Another feature you may want to be included in your watch is a power meter. A power meter is what’s used for precise measurements when cycling. But this level of precision does not come without a high cost. So if you’re just starting off, you may not want to invest in this feature. But if you’re looking to improve time and distance and advance in your triathlon racing, then this may be a feature that takes you to that next level. Look at all the different features your potential watch has for running. Check if your watch counts steps, distance, pace, calories, elevation gain, and others. Whatever is important to YOU, make sure your potential watch offers it. Although, running features for watches are mostly universal. You will find most functions are standard throughout all the different watches if you’re comparing apples to apples. Meaning, smartwatch vs. smartwatch and digital watch vs. digital watch. Some watches will take it one step further and track metrics like cadence and ground contact time. Cadence is how many times your feet strike the ground per minute and ground contact time is how long your foot stays on the ground once it hits. These features help you to become an efficient runner. Better efficiency in running means being able to run further and faster with less effort. A triathlon watch with extra running features like these can do just that, help you run further and more quickly. Another essential component is battery life. I’ll tell you what’s frustrating, being halfway through a training session or race and having your watch die. Ask any experienced runner, and I’m sure they’ve had a similar experience. Through the past development of smartwatches, battery life has always been an issue. Today, some of these watches seem to last forever. But still make sure you take a look at the battery life of the watch before making your final purchase. Make sure it holds a charge long enough for the length of your races and training sessions. For example, you may not want to spend extra money on a watch with longer battery life if you plan on competing in sprint triathlons. Whereas if you compete in IRONMANS you don’t want a watch that needs a constant charge. Also know that if your watch states it lasts 24 hours while tracking, that doesn’t mean it only lasts for 24 hours. Think about it, you’re not always training. So this watch with 24-hour battery life could stay on for over a week without a charge. So be careful when reading the wording. One last thought. Make sure your watch’s battery is high quality and will hold a charge over its lifetime. Most of us have had a brand new smartphone that had a charge last for a few days but over time it only lasted for one day. Well, this same concept goes for your triathlon watch. So check customer reviews and make sure the battery consistently holds a charge over the years. How the watch transfers data is a component to consider. When I say data transfer I’m referring to how the data from your watch transfers to your computer or phone. That’s assuming your watch has a program to transfer it to. This allows you to view your training data and even post it on social media. If it’s a smartwatch, chances are it has this capability. Make sure you find out how the process works. Different watches have different connectivity options. For example, some use a simple wi-fi connection while others use cords. So take a look at how your watch connects to the digital world and if it’s the option best for you. Last and certainly not least, the price is a significant factor that influences how we buy anything. You want to make sure you get the most for your money’s worth. So how do you go about determining your purchase based on price? Do you buy the least expensive watch but sacrifice all the useful new technology? Or do you break the bank and buy the top watch on the market? Or maybe you find a watch somewhere in between the two. This will be a decision you have to make on your own. If you’re experienced in triathlons, then you probably have a specific price point. However, for newcomers, it can be difficult to decide if it’s worth putting out the extra money or not. Decide if you want to go the low-cost option and potentially upgrade later. Or just put out the extra money and invest in your future triathlon career. The choice is yours, but one thing I’d do is look at the user reviews. From experience, I’d say Amazon reviews are the best. Pull up the 3-4 star reviews and see the positive and the negatives and make the best choice for you. If all else fails, make sure the watch is stylish too. This way if you back off of triathlon training you can still wear it throughout your day. So now that you know how to pick out a triathlon watch, it’s time actually to pick one out. Where do you start? Simple– keep reading below and take a look at the 8 top triathlon watches of 2018. 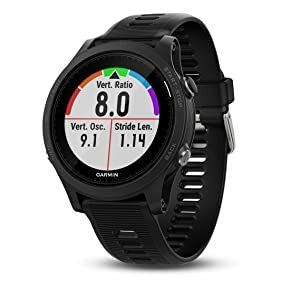 Let me start by saying that the battery life of the Garmin Forerunner 935 lasts for 24 hours while using GPS. If I’m a serious triathlete then that puts this watch on the top of my list. There’s a lot to think about during a triathlon. Worrying about if your watch is going to hold its charge or not is the last thing you need to do. If you’re a competitor, this watch has the batter life you want. Then add in its thin construction and super lightweight feel, and it takes the number spot for the best triathlon watch in the market. The whole design is built to help with your training to improve your performance on race day. It tracks your running miles, swimming strokes, and even your cycling. One of the most useful features is how it tracks your cadence while you run. Tracking your running cadence helps you become a more efficient runner. Running with more efficiency will ultimately make you faster. Experienced triathletes rest assure this watch is compatible with MANY different bike accessories. Not to mention, you can buy a quick-release kit for a quick transfer onto your bike on race day. If you’re looking to compete or improve your performance in general, then this may be your best choice. Its users love it for how long the battery lasts. Pros – Lightweight and thin material, long-lasting battery, accurate GPS, compatible with wide range of bike accessories, many functions. Cons- It’s not the cheapest watch on the market. The Garmin Forerunner 735XT is a multi-functional watch that makes training easier. First, its super lightweight constructed with a comfortable silicone band. I know, sometimes watches can be irritating on your wrist. This watch appears to do the opposite. Some users say they barely even notice this watch is on while training. It’s built for swimming, cycling, and running demonstrated through its multi-sport mode. You can change modes and data screens by a simple push of a button. This makes for a convenient and straightforward experience for newcomers. Just one less thing to worry about on race day. What sets this watch apart from others is how it monitors your heart rate from your wrist. So that means no additional chest strap required. It also sends smart notifications and makes data transfer easy to your favorite social media page. The users of this watch praise it for its overall weight, feel, size, and look. 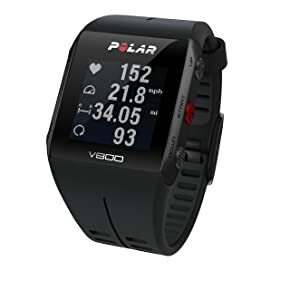 Pros- Packed with a lot of functions, wrist heart rate monitoring, multisport mode, lightweight and thin, impressive screen display. Cons- Battery life could be better, some say the swimming distance tracking is off at times. One of the best features of the Polar V800 is its scratch resistant lens and high contrast screen. This creates much better lightening and visibility which is excellent for beginners and experienced triathletes alike. The simpler and clearer the screen is the better. This watch also includes a GPS system that comes in handy during long bike rides. That’s because the longer the race you’re training for, the longer your bike rides will be. So having a GPS system will help you get home when riding to new places you’re not familiar with. While on the subject of bikes, this triathlon watch comes with an internal barometric altimeter. This tracks hills while cycling. It also comes with all the best tracking and performance features for speed and distance. It will even count your steps throughout the day if desired. Please note: this watch is waterproof up to 30 meters, this is on the low end of triathlon watches. 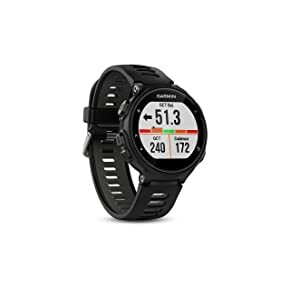 Overall, it’s an excellent watch for beginners and intermediate triathletes. Its users praise it for its useful smart notifications. Pros- Scratch-free lens, durable, easy profile customization, Bluetooth heart monitor included. Cons- heart rate is not measured by your wrist, bulkier than others, older style. I will keep this one nice and simple. The Suunto Spartan Ultra HR is the watch for your next IRONMAN. It has a battery life of 26 hours in training mode! And it’s water resistant up to 100 meters! Oh… and the face is made out of titanium 5/steel with sapphire glass. So let’s sum it up– this watch is built to last over a whole lot of mileage whether you’re swimming, biking, or running. 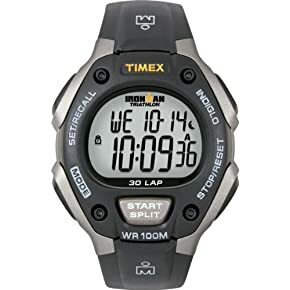 But if you’re taking your training to the next level and want to finish an IRONMAN then this watch is one to consider. It users praise it for syncing nearly instantaneously with its GPS system. And this comes in handy when racing out in Mother Nature. Pros- Extended battery life, excellent water resistance, GPS route navigation for route mapping. No, this is not a smartwatch. But not everyone desires a smartwatch packed with new technology and features. The Timex T5E901 is a digital watch with only a few basic functions. It tells the time, has a stopwatch with 30 lap memory, and uses a countdown timer for up to 24 hours. It has a night-mode where the background like glows for visibility in the dark and is water resistant to an impressive 100 meters. If you are looking for one of the most affordable watches on the market that’s both durable and simple to use than this is the watch for you. Its users love it for its reliability. Pros- Easy to use, durable, low price. Cons- Not a smartwatch, very little functionality. 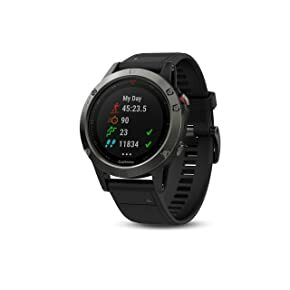 The Garmin Fenix 5 comes in many different colors, bands, and faces. It’s by far one of the more stylish triathlon watches out there. This provides a good chance of finding a watch that fits your specific taste. It offers many of the same components as other triathlon watches like monitoring strides, distance, and time. However, it differentiates itself from the competition by providing a few unique functions. For example, it includes sleep testing as well as measuring your lactate threshold. It’s super convenient too. The GPS navigation system can connect data transfer via WiFi. It’s also water resistant up to 100 meters. So unless you’re deep sea diving in the Indies, or in search for the lost remains of the Titanic, this watch pretty much eliminates any problems that can be caused by water. Also, it measures your heart rate from your wrist and can even measure the length of your stride. Its rugged construct is a favorite among many triathletes and makes it reliable too. It users love how you can read the screen even under direct sunlight. Pros- A quality build, easy to use GPS system, a ruggedly stylish look, durable, water resistant up to 100 meters. What I noticed first about the TomTom Spark 3 is that it comes with Bluetooth headphones and can store music. This is super convenient. With this watch you no longer have to carry both a watch and a musical device. Also, users say it’s precise too. It will track your every movement whether you’re swimming, cycling, or running. It tracks movements like your stroke rate, pace and pedal speed, and your running cadence. It will even allow you to set your desired heart rate zone which can be quite helpful when training for a triathlon. For example, say you want to stay in an aerobic state and know for you that’s between 120 bpm and 140 bpm. You can set that range and receive an alert anytime you step outside of it. Its users praise this watch for its breadcrumb trail which traces your path while running. This way you can use it to find your way home if you get lost. Pros- Bluetooth headphones, plays music, breadcrumb trail, set heart rate zones, excellent GPS. Cons- Some users had an issue with sleep tracking. If you’re looking for a triathlon watch to get you started and don’t care about all the bells and whistles than this is the watch for you. 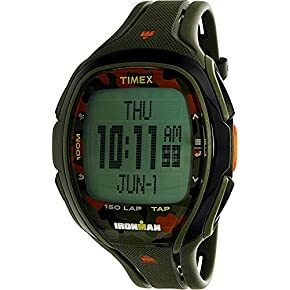 The Timex Ironman Sleek 150 has been around for quite some time and has every color option you could ever want. And at such an affordable price maybe you’ll pick up more than one to match your favorite triathlon outfits. 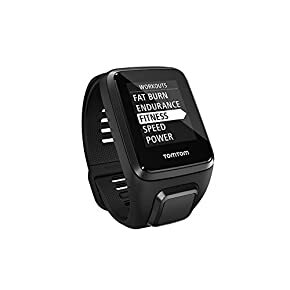 Although it’s not a smartwatch it still offers many useful features to help with your training. As the name states, it’s built for IRONMANS. Also, while looking at the name you will see the number in the title “150”. The number 150 tells you it can track up to 150 laps. It’s also waterproof up to 100 meters. This watch is thin, lightweight, and the display is extremely clear to read. Also, you can track speed, pace, and distance digitally. You can even program target times and intervals for custom workouts. With all the smartwatches available these days, sometimes it’s refreshing for a little simplicity. So if you’re looking for the basics, this watch is an excellent choice. Its users love it for its perfect face size and lightweight feel. Pros- Low price, trusted brand, water resistance up to 100 meters, can track a lot of laps, many color options. Cons- Not many functions compared to smartwatches. People of all different shapes, sizes, and speeds compete in triathlons. That’s why it’s important to track your specific performance. This way you can monitor how you’re progressing through training and keep track of your progress on race day. But no matter what watch you buy, it’s always important to make sure it’s the best watch for YOU. Now that you have read how to pick out a watch and looked through the top 8 in 2018, you can buy a watch with confidence. It’s time to take your triathlon performance to the next level with a new triathlon watch.